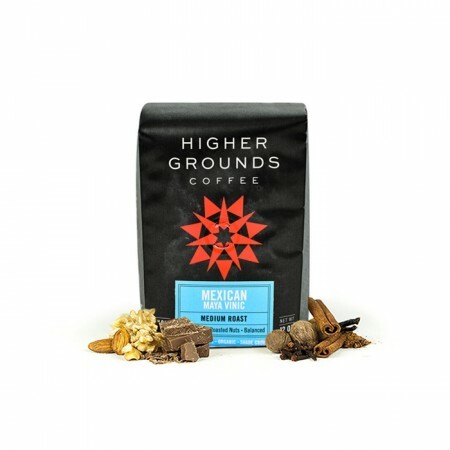 The Mexico Maya Vinic was carefully roasted for you by Higher Grounds Coffee. This fully washed coffee is Fair Trade and Organic certified and was grown by small holder producers in the Chiapas region of Mexico between 900 - 1,400 meters above sea level. This medium light roast has is balanced with notes of roasted nuts and cinnamon. The smelled deliciously of roasted spiced nuts right out of the bag and tasted just as delightful with a hint of cream added. Excellent roast. Excellent coffee with a wonderfully sweet smelling nose with a certain amount of subtlety which I enjoyed. My first thought is balanced, yes. Smooth. I couldn’t pick up any particular flavors here other than coffee. That’s not a bad thing though! The notes of cinnamon and roasted nuts make this a smooth and balanced coffee. The Mexico Maya Vinic was probably the best coffee I've ever tasted! I liked it even more than my usual Hawaiian Kona Blend. It was balanced, not overcooked and burnt tasting, but not so mild as to be boring. There was a definite nuttiness about it that I really liked. I'm looking forward to see what you choose for my next coffee! I'm leaving this one up to you! P.S. I'm not afraid of a little chocolate! Very smooth. I did a pour over. Strangely sweet while not have flavor associated with sweetness. Tastes nutty, then following is overwhelming sweetness. Love this coffee. It smells wonderful and the chocolate and nut flavor is bold and well balanced. This makes a very balanced cup. There are definite notes of chocolate, nuts, and baking spice. It's very easy to drink and straight forward - not a lot of nuance. I wouldn't make this a daily drinker but it's something I would serve to family and friends visiting for an easy, drinkable coffee experience. Not very smooth and a bit bitter for my taste. Very robust flavor from my chemex, but oddly bland as espresso. Great aroma, and decent pour over, wish it came out better as espresso. This is one of the best coffees I've ever had. Huge roasty notes in a relatively lightweight package. It's complex but not over powering. You can pick up the delicate baking spices, which is new for me in a coffee but I enjoy it. I could easily get a 5 pound bag of this coffee and drink it for 4 months. Full body, excellent flavor. Loved this one. This was the best coffee I've gotten so far! I'm not sure if it was the notes or region of origin but this coffee was fantastic! Would love to get more similar in taste to this. Nice Cup. Well balanced. Enjoyed it. This was cup that I was excited to reach for every morning, because the cinnamon was so pronounced; reminiscent of café de olla. The best Mexican beans I've had. One of the better coffees I’ve tried. Nice earthy tasting. Not to my taste. May work well for others. Nutty, spicy, chocolate, full bodied flavor. One wants to remember this coffee, as there's no bitter aftertaste. Best yet. Particularly good. thoroughly enjoyed and will order again. Taste is muddy. Note as rich as I would prefer. Not enjoyable. Nutty with a slight brightness, very well balanced coffee.